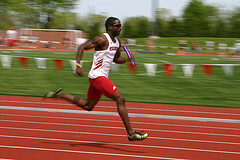 usually involves small tears in the leg muscles where they are attached to the shin bone. This injury can be caused by excessive running or jumping on hard surfaces while using inadequate footwear. If left untreated these tears can lead to stress fractures. The best way to prevent this injury is to stretch and strengthen the lower leg muscles. Heel Drop Stand on a low step with feet together. place weight on right foot and bring left toes to the edge (heel hanging off), then dip left heel a few inches below step. Hold 30 seconds; switch feet and repeat. Supine hamstring stretch Lie faceup on floor in doorway with right leg extended and left leg propped up against wall, as close to vertical as is comfortable. Hold 30 seconds; switch legs and repeat. Soleus Stretch Stand with palms against wall at shoulder level. Step right foot forward a few inches and bend knees slightly. Bend elbows and lean into wall. Hold 30 seconds; switch legs and repeat. First take a break from the exercise that is causing this pain. Icing the tender area, as well as stretching prior to and post exercise is very important. Spend time strengthening the lower leg muscles (Gastrocnemius and Soleus muscles), with a regular resistance program, calf raises etc.. Aspirin can help reduce pain and inflammation, but if pain persisits seek the advice of your doctor. 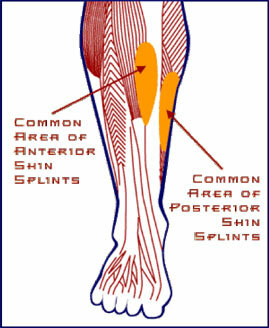 To return to from the shin splints page to the Fitness Tips Page click here.